Vibrating 28,800 times per hour, the Calibre 1887’s 39-jewel, 29.3mm x 7.13mm movement is made of 320 components and has a 50-hour power reserve. A powerful, robust and easy to maintain engine, it houses an audaciously re-engineered version of its inspiration, the brand’s 1887-patented oscillating pinion, along with a matching column wheel. The oscillating pinion, patented in 1887 by Edouard Heuer, works in tandem with the column wheel, in much the same way as an automobile transmission. The column wheel, which coordinates the start, stop and return-to-zero functions of the chronograph hand, functions like a gearbox. The smoothness and precision of its super-soft click start is a recognized element of high-end watchmaking excellence. The oscillating pinion works like a clutch. The optimized version in the Calibre 1887 enables the chronograph to start in less than 2/1,000th of a second. 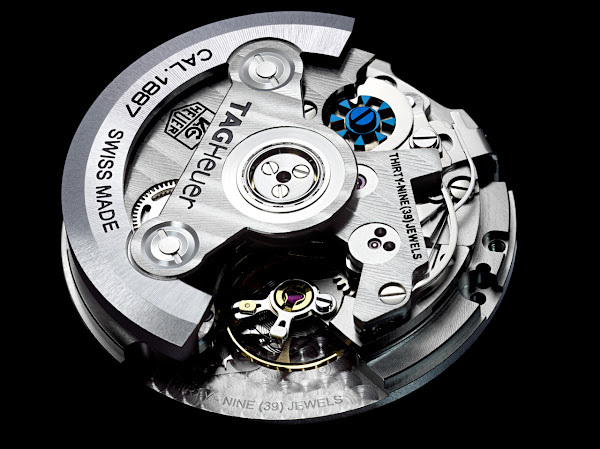 The Calibre 1887 is also equipped with a High Efficiency Rewinding (HER) system, acknowledged by watch experts as the world’s most efficient rewinding device because of its bidirectional automatic structure, which delivers 30% more efficiency than the traditional inversor system used in most Swiss chronographs. The HER is also famous for its superior reliability and sturdiness. The Heuer Carrera was born in 1962 in the pits and paddocks of the Twelve Hours of Sebring, where Jack Heuer, official timekeeper of the event, first heard tale of motor-racing’s most gruelling endurance competition, the “Carrera Panamericana Mexico Road Race”. It also pays homage to TAG Heuer’s unique timekeeping contributions to the racing world, radical innovations like the Time of Trip (1911), the first car dashboard chronograph; the Mikrograph (1916), the first sports stopwatch accurate to 1/100th of a second; and the Autavia (1933), the first 12-hour dashboard timer for AUTomobile and AVIAtion. When he launched the Carrera in 1964, legibility was Jack Heuer’s highest priority. By placing the 1/5th of a second-scale in the inside tension ring of the crystal, he freed up 2 mm of space on the flat dial. It was a world first and an instant success, a favourite of watch and motor-sports enthusiasts alike for its timeless design, uncluttered style and functional and minimalist elegance. 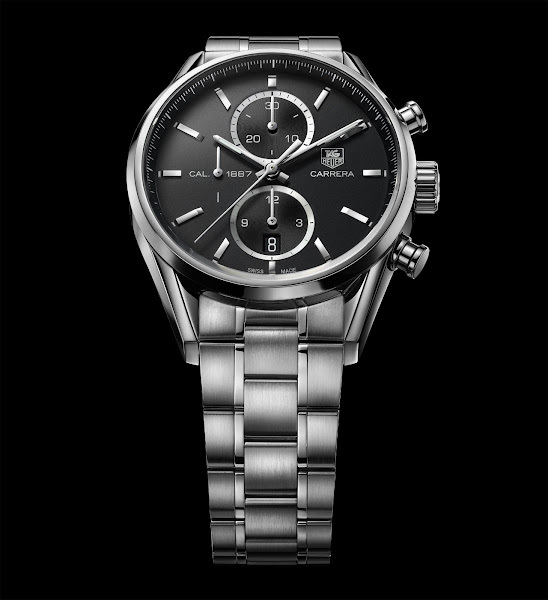 Relaunched in 1996 and completely revamped in 2002, the Carrera is one of TAG Heuer’s most iconic creations. It has been worn by hundreds of TAG Heuer driving greats, including Juan Manuel Fangio, Kimi Räikkönen or Lewis Hamilton.